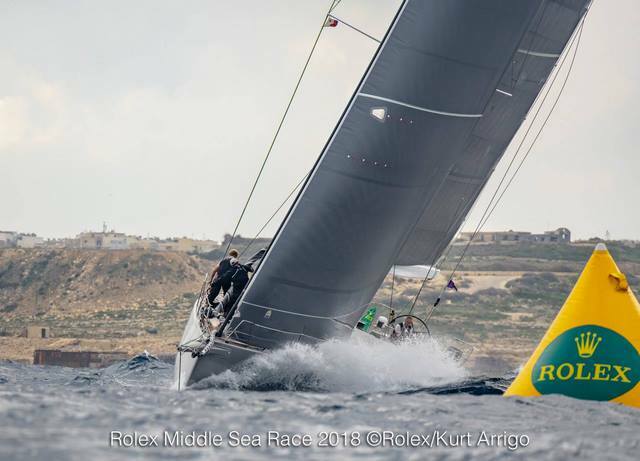 The first 24 hours of the 2018 race have proved once again that the challenging nature of the Rolex Middle Sea Race is as much a test of concentration and perseverance in light airs as it is seamanship in heavy conditions. 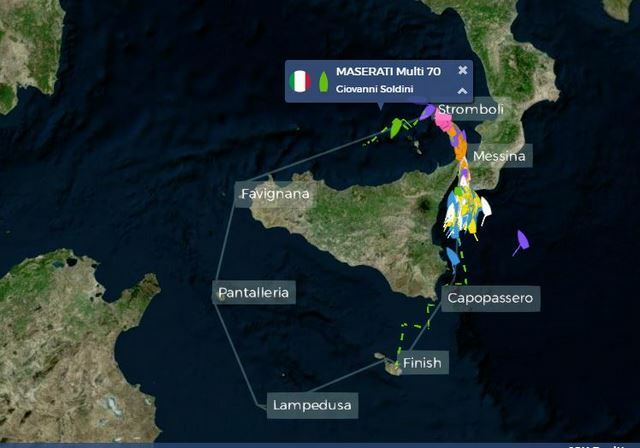 While a substantial pack of yachts has passed through the Messina Strait, the bulk of the 130 boats fleet has suffered a frustrating day making slow progress up the eastern seaboard of Sicily towards the infamous strait. This morning, the Italian trimaran, Maserati, was the first yacht to break into the Tyrrhenian Sea, exiting the narrow body of water just before 0800 CEST, an hour and a half ahead of her closest rival, PowerPlay. Maserati pushed onto Stromboli, which she eventually rounded at 1030 CEST. Confronted by a westerly, but moderate, air stream, Giovanni Soldini’s crew have some work ahead before they reach the north-western corner of the 606nm course and make the turn south to Pantelleria and beyond. Behind this pair of multihulls, the battle to be first home among the monohull fleet at last appears to be going to the pre-race expectations. 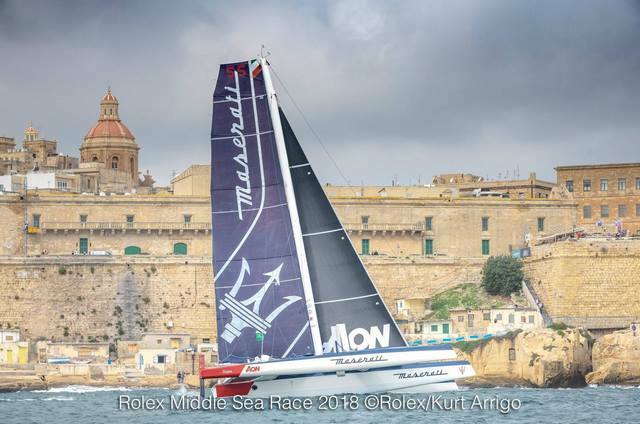 During the hours of darkness, the Maxi 72 Momo had managed to wiggle past her larger rival, Rambler, by staying inside the rhumb line and heading inshore after Siracusa. A few hours later, George David’s team took back the initiative; her more offshore position presenting her with the opportunity to head direct for the entrance to the strait on the Italian mainland side. The American maxi’s immediate rivals then appeared to get caught in a hole, and their crews must have felt a gnawing feeling in their stomachs as a group of smaller IRC Class 2 yachts followed Rambler’s lead and took the more offshore route, overtaking their more powerful opposition in the process. In the mid-morning, though, the two groups converged at the entrance to the strait, with Rambler clear ahead, but stalling once again. 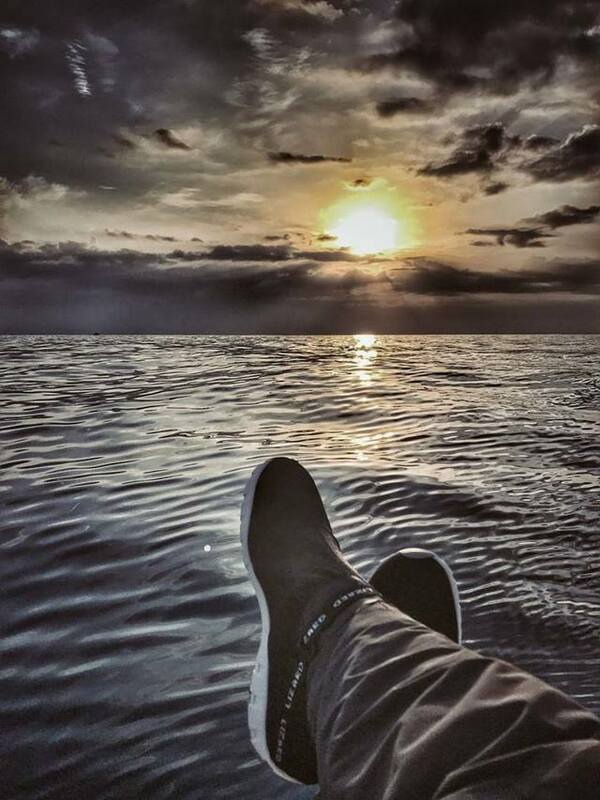 Rambler bled some distance to her chasers, but in the more confined waters found fresh breeze that propelled her into the open sea. At just after 1700 CEST, Rambler finally rounded Stromboli, the iconic landmark of the Rolex Middle Sea Race, and will now look to extend her slim advantage over Momo during the next leg. Around 10nm further back, a select group of fifty-footers is hanging onto the coat-tails of the leaders. Freccia Rossa, holds pole position on the water, attesting to the light wind prowess that saw the Russian TP52 win the 241nm Rolex Giraglia in 2016. 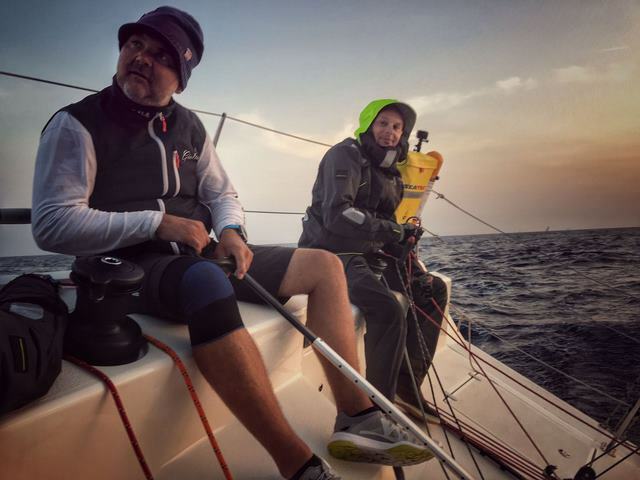 Ahead of the start, crewmember Jean Philippe Gallois, had felt the predicted conditions for the early part of the race would suit them: “From the start to Messina the wind is expected to decrease. It will be tricky getting through the strait, but those light winds will be interesting for us.” Gallois went on to express uncertainty about the forthcoming weather and its impact on the race. A low-pressure system is expected to hit the north and western reaches of the race area over the next day or so. 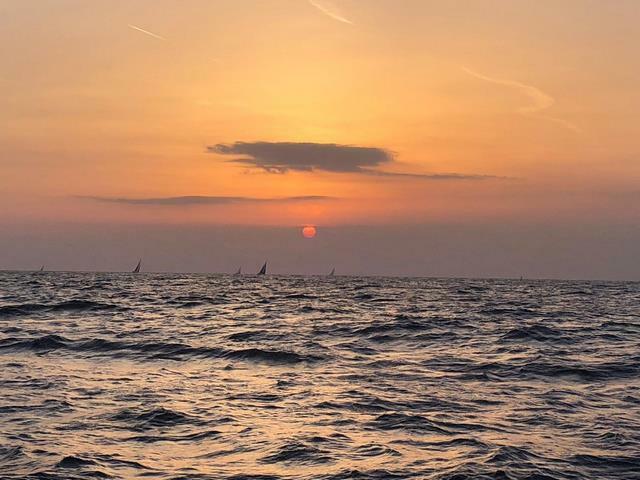 The timing of its arrival will determine which boats face a fast reach and which have to contend with an upwind slog on the leg across the top of Sicily. The eventual timing may well determine the outcome of the race. 1700 CEST Day Two – Class Analysis After enduring a frustrating day, 23 crews had passed through the Messina Strait, and are now enjoying faster reaching conditions towards Stromboli, the most north-easterly point on the course. For those still to pass through the narrow body of water between Sicily and the Italian mainland there is some relief as the wind strength has built from zephyrs to a gentle breeze. With it has come rain, which has not yet dampened spirits. IRC One The German Botin 65, Caro, skippered by Maximilian Klink continues to impress and Vicente Garcia Torres' Spanish Swan 80 Plis Play is also in good form. The largest yacht in the fleet, Nikata, has struggled to make use of her waterline length so far. Wild Joe from Hungary has suffered a hydraulic oil issue that has caused her to pull into Reggio di Calabria to see if the problem can be rectified. IRC Three Three teams are through the strait and estimated to be leading the class after IRC time correction. They are: Vittorio Biscarini's Ars Una, Dominique Tian's Tonnerre de Glen and Frederic Puzin's Corum Daguet 2. 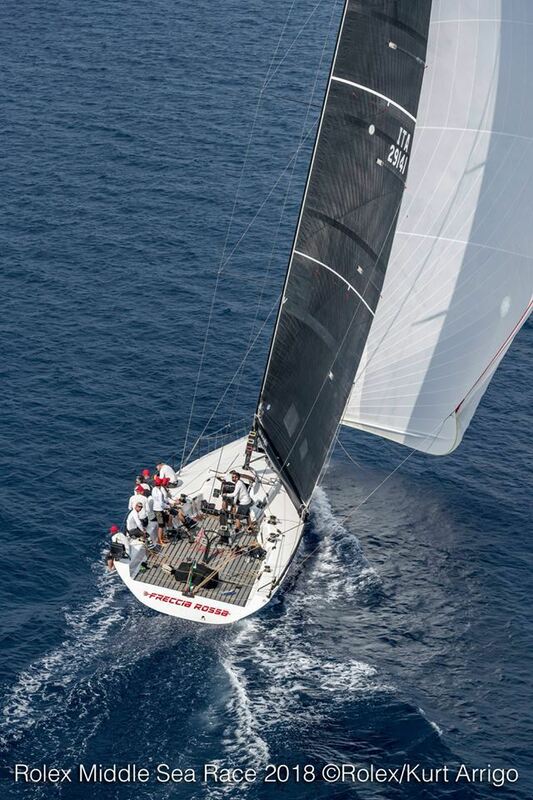 IRC Four Austrian Swan 651 Lunz Am Meer, skippered by Riccardo Genghini and one of the oldest boats in the fleet, is one of two yachts in the class to be on their way to Stromboli. She leads her class on the water by a significant margin, with the Italian Swan 42, Be Wild, skippered by Luigi Masturzo, in second. The Czech Republic entry, Daring Sisters, another Swan 42 and skippered by Milan Hajek is third. IRC Five None of the 35 yachts are through the strait. 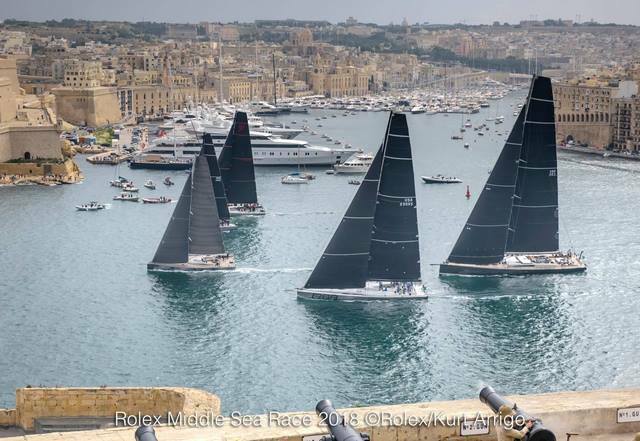 The leaders have hit better breeze since passing Siracusa and, currently, Géry Trentesaux's Courrier Recommandé leads Nicolas Ibañez Scott's Chilean team on Anita, Giuseppe Cascino's Italian entry Joy RC – Yachting put in a good shift to move up to third. 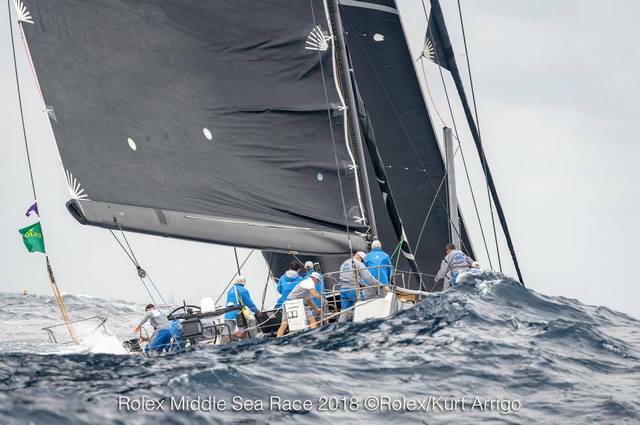 IRC Six Four teams are enjoying a close battle at the front of the small boat class: Kabestan Intuition, skippered by Dmitry Kondratyev, Igor Rytov's Bogatyr, Gerard Ludovic’s Solenn and Piercarlo Antonelli's Bora Fast. 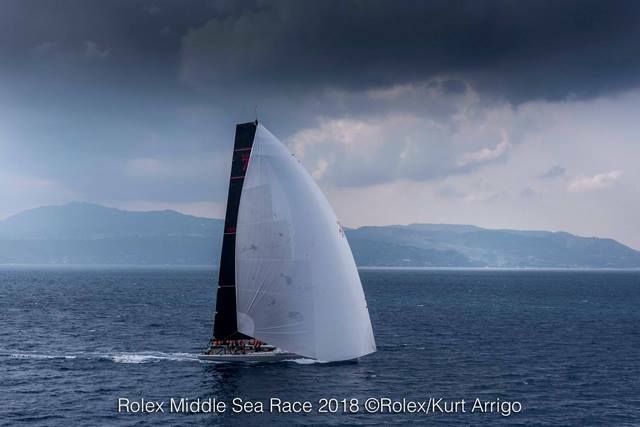 IRC Double-Handed Last year's winner overall Bogatyr is racing short-handed this year and is estimated to be leading the nine-strong short-handed fleet. In the meantime, Marco Paolucci's Libertine is battling with two Maltese teams, Jamie Sammut's Unica and Sean Arrigo's Otra Vez.